Are you worried about the radiation from you mobile phone while you are calling people? No you can rest assure that you are safe. Just connect this external phone horn to your phone and you are good to go. 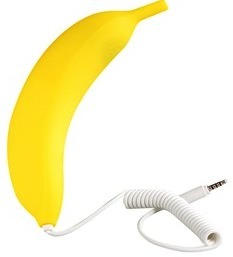 OK this phone handset looks like a banana but that makes it even more fun. Just image the people staring while you are talking into a banana. Just connect the banana to your phone’s headphone jack and you are good to go. It will work with almost any phone that can use headphones with build in microphone like the iPhone and most Android phones. Come and have a closer look at this Banana Phone Handset. Do you like Star Trek? 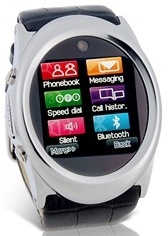 If so then this Communicator from the first series is a must have for you. And it is not just a cool looking toy it actually works to. You can use the build in microphone and earphone for Skype, MSN, AIM, iChat and so on. And when you are not using it for VOIP you can use the 21 build in sound effects to impress your friends. Why not use different ways of using your iPhone then just a cell phone. SIP is a great way to get low cost phone calls and now it even works on an iPhone. As you read yesterday’s story about how to configure your iPhone to use MagicJack then you know how I did it. But today I will just focus on how SipPhone works. SipPhone is simpe just download SiPhone on iTunes and for $6.99 you can start using it. OK the application is not free but for that amount you get an application that can help you to get your phone bill down. After you downloaded and configured SipPhone you are ready to go and beside the different look it almost works the same as the normal phone on your iPhone it just looks a bit different. On the bottom of your dial pad you have two buttons one said Cellular and when you use that you use your normal phone and one that says SIP (should be green to use it) and that one is used to make your SIP call. And that is all to it. you have some settings like the ringer for when people call you but that is about it. It uses your normal address book to find you contacts to call and by default it will use the SIP phone so no worries that it calls through your wireless. For me SipPhone is a great way to bring my bill down. I spend a lot of time in locations where WiFi internet is available and now I can use that free internet to call. If you have a SIP account somewhere and an iPhone then why not use it go try out SipPhone on iPhone yourself and see how easy it is. As an iPhone 3G owner I thought form the day I got my phone that it would be great if I could use the WiFi to call with for instance Skype. As you may remember I use MagicJack to make my phone calls through the computer and for less then 20 dollars a year I can call anyone in the US and Canada and get great international long distance rates as well. And then I found a post somewhere that you can get Magicjack working through SIP and that made me trying to find a Sip application for the iPhone and that was easy there is an application called SipPhone (review will follow) that you can use to call through WiFi. Then of course I needed to get it working and this is how I did it and it was not as easy as I thought but with lots of help I was able to get it working. First of all you need to find you SIP information from your MagicJack plug and YES that means that you need to have MagicJack before you can use it on your iPhone. So now you are almost ready to go. But you need to find out what city your proxy uses and you do that as followed. Look at the ProxyIP (mine was 67.91.177.70 as you can see above) then go to this WIKIbook for MJ Support and there you can see what proxy belongs to the IP address. On main screen under Accounts, select edit, select add new SIP accounts. Go back to main screen and select Settings on bottom right. After you do all this go to Dialer and you should see the cellular and SIP buttons turn green. Make calls!!! So now you are ready and you can use MagicJack on your iPhone. Be carefull and do not use Magicjack at home and on your iPhone at the same time! Tomorrow I will give you my experience with SipPhone so come back and read about that.